Over here in Perth we woke up to heavy rain and lots of wind! Today was a great day for a soupy lunch! I had spotted a wonton soup by Meg’s mate Curtis Stone. It was in the latest Master Chef magazine. This recipe is pretty well similar. I have converted it and added a few little touches of my own. I guess all the best recipes are an inspiration from somewhere. I also made my own wanton’s! I reckon this recipe could be endless with the choices you can make for the broth and the wonton fillings. Baby Spinach, Fresh Coriander, Fresh Chilli or Chilli Paste, Finely Sliced Spring Onion, Lemon. Add Chicken thighs (Cut in to quarters) and Cabbage piece (Cut in half) with the sauces and egg into the TM bowl and set to closed lid position. Give Two quick turbo blasts. 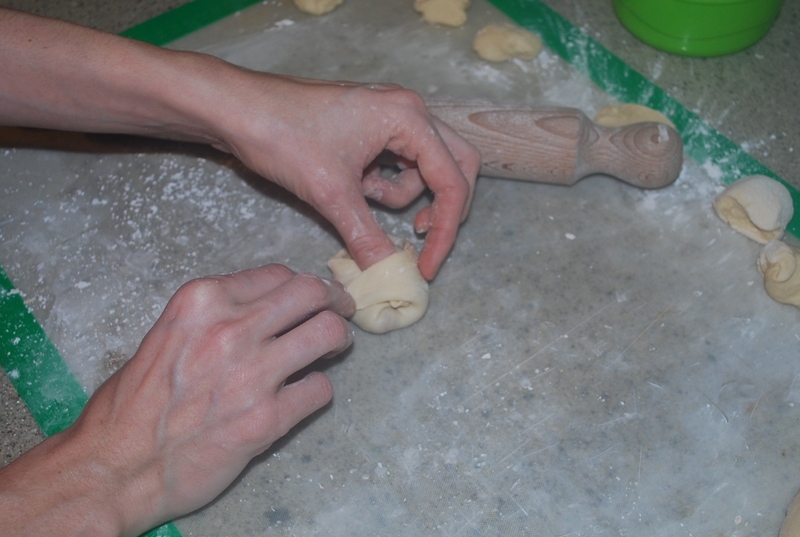 Set aside to make wonton’s. Add ginger to TM bowl and blitz on Speed 6 for 5 seconds. Add remaining ingredients to the TM bowl and cook for 15 minutes, Varoma Temp on speed Reverse + 1. Once cooked leave to infuse the flavours until you are ready with the wonton’s. If using the fresh wonton mixture – there should be enough for 24 wontons. 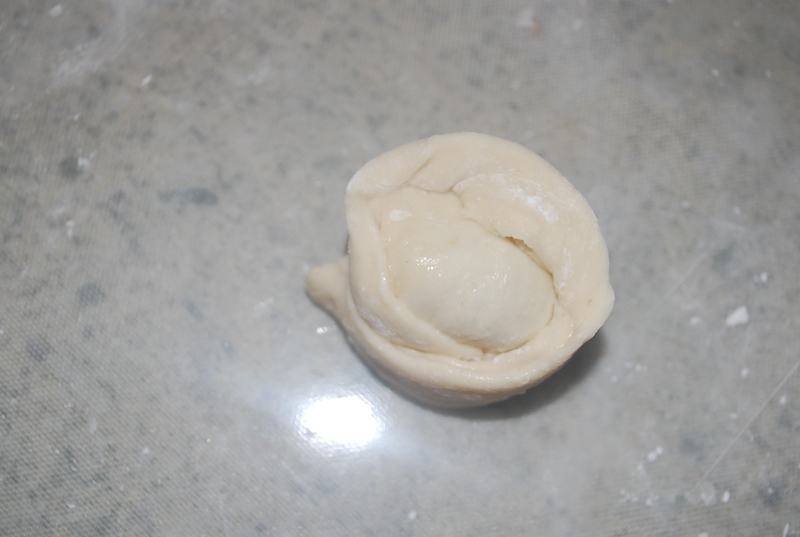 Divide dough into halves and then each half into 12 small balls. From the small balls roll flat into square pieces. 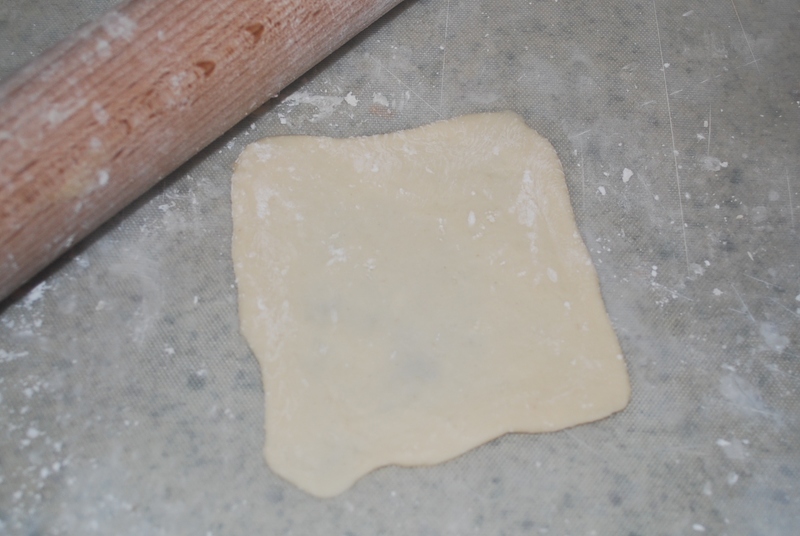 Use cornflour to help roll the wonton’s out and prevent from sticking. Place a small spoon full of the chicken mixture in the middle of the wonton wrapper. Rub a touch of water around the edges of the wonton and then fold the wonton in half so that you are left with a triangle. 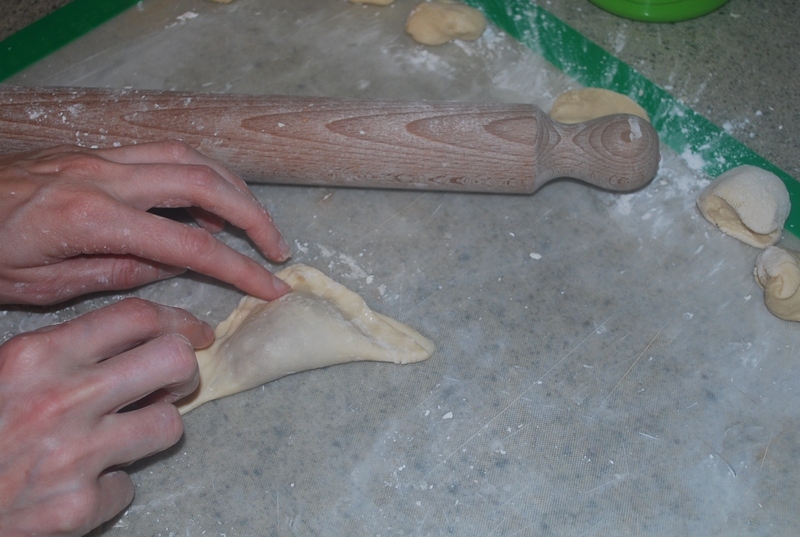 Press down the edges to seal the wonton. Bring the two bottom corners into the middle. Use a touch of water to help them stick. Rub a little cornflour into the TM basket. Put the wontons into the basket. You will fit between 6 and 8 and you will have to cook them in batches. Strain the broth through a sieve to remove the larger pieces. 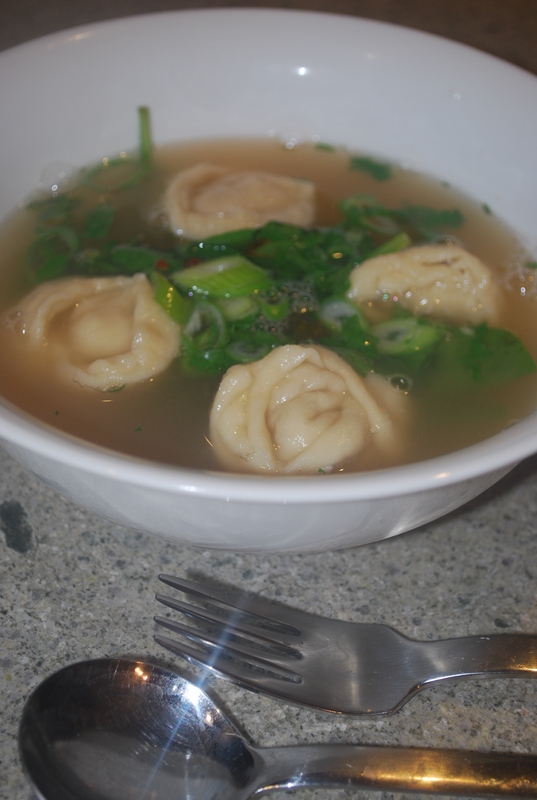 Add broth back to TM bowl and inset basket full of wontons. Cook on 100 degrees, for 5 minutes. Remove wontons from TM basket and cook next batch. 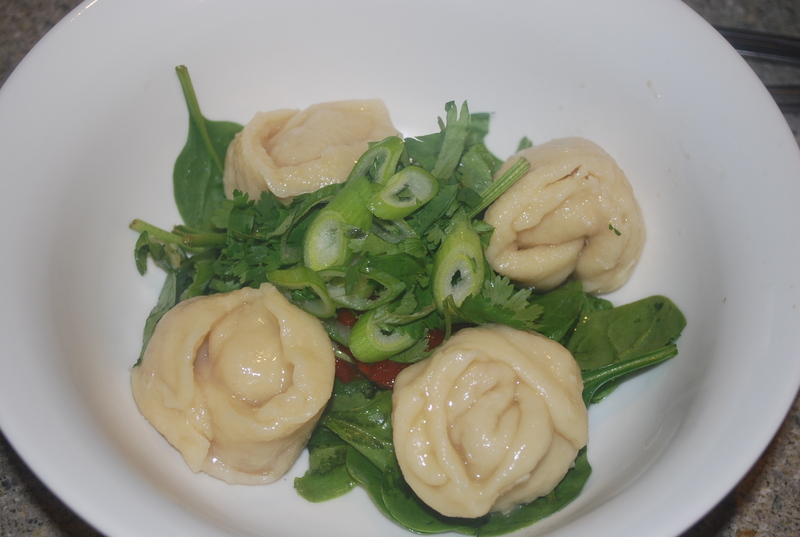 When you are ready to serve add baby spinach, chilli, lemon, spring onions and coriander to the serving bowl. 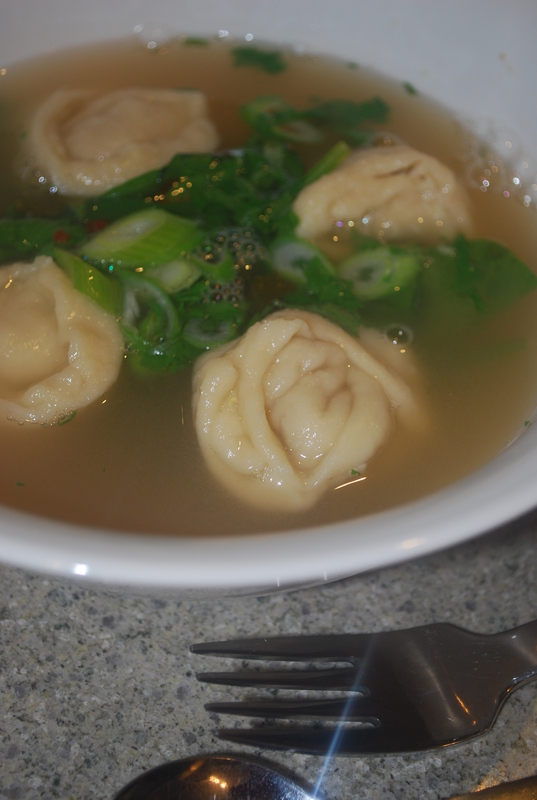 Add 4 – 6 wontons and pour broth over top. 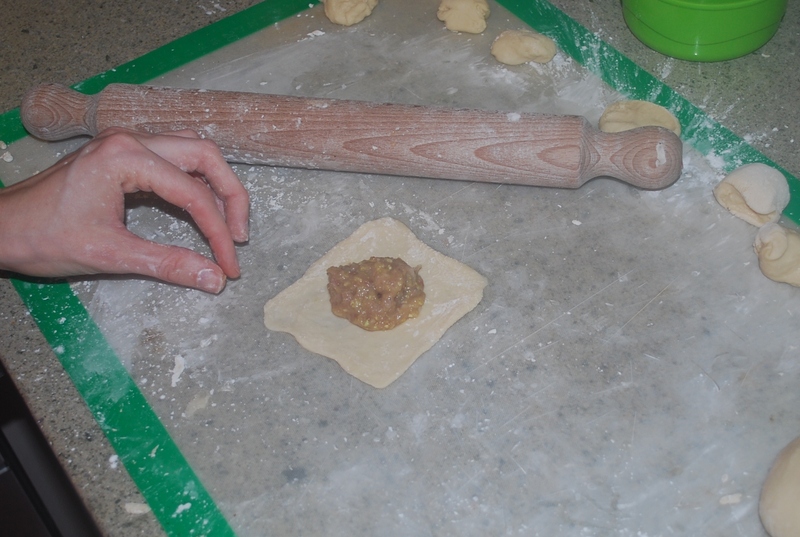 Here are a few pics of putting the wontons mixture into the wrappers – hope they help! Here is the pics of the bowl and then the soup in it.